For the latest installment of his ongoing series “Studying Skywalkers,” Coffee With Kenobi co-host Dan Z catches up with Ian Doescher, author of the William Shakespeare’s Star Wars series to discuss his recent book tour. 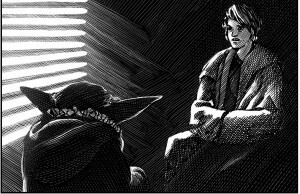 When William Shakespeare’s Star Wars first appeared in July of 2013, audiences were delighted to discover that the work of George Lucas was being interpreted in Shakespearean language. Author Ian Doescher had the idea of taking the Star Wars films and adapting them in perfect iambic pentameter (as well as other styles of poetry). The results set the publishing world ablaze, and managed to please both fans of Star Wars as well as lovers of Shakespeare. Multiple New York Times bestsellers later, Ian has embarked on a multiple city tour to promote the latest book in the series, Tragedy of the Sith’s Revenge, Star Wars Part the Third. Read the rest on StarWars.com, and check out Dan’s other entries here. Be sure to listen to the most recent CWK Book Chat, featuring Ian Doescher. Next article New Star Wars Rebels Trailer! *UPDATED* With an All-New Clip! Great read, Dan! Since reading Ian Doescher’s first Star Wars book, I have been a fan. He nails it — melding the classic space fantasy and the Bard’s work. 🙂 What a treat!